A huge thanks to Marty at A Stroll Thru Life for organizing this Fall Tour of Homes. She is so on top of her game – don’t miss her tour. If you are new here from A Thoughtful Place or another blog on the tour, welcome! Fair warning that I’m not near as talented as all those other ladies and also don’t speak as eloquently as they do. I’m also just weird. And random. You’ve been warned. You may have already figured that out. But in the fall, I love it a little bit more. Which I didn’t even know was possible. I don’t even know why I love it a little more in the fall besides the fact that I drink a bit more Jack in the fall and what pairs better with Jack than country music? Nothing I tell you. Nothing. So in the fall, instead of leaving my grandfather’s cowboy hat tucked safely away with the vintage cowboy blanket, I pull them both out. 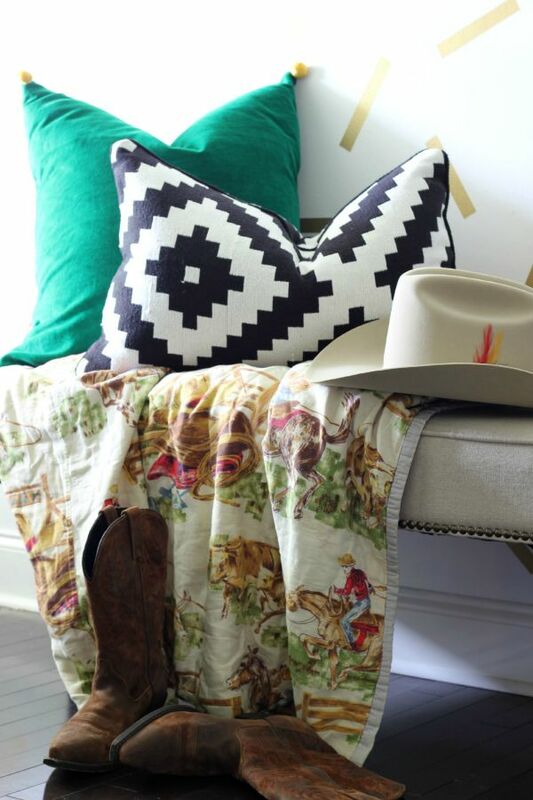 Because what’s better than a kelly green pillow paired with a modern black and white one and cowboy paraphernalia all against a confetti wall? Random? Yes. But it makes me smile. And I might play a little bit of musical lamps. 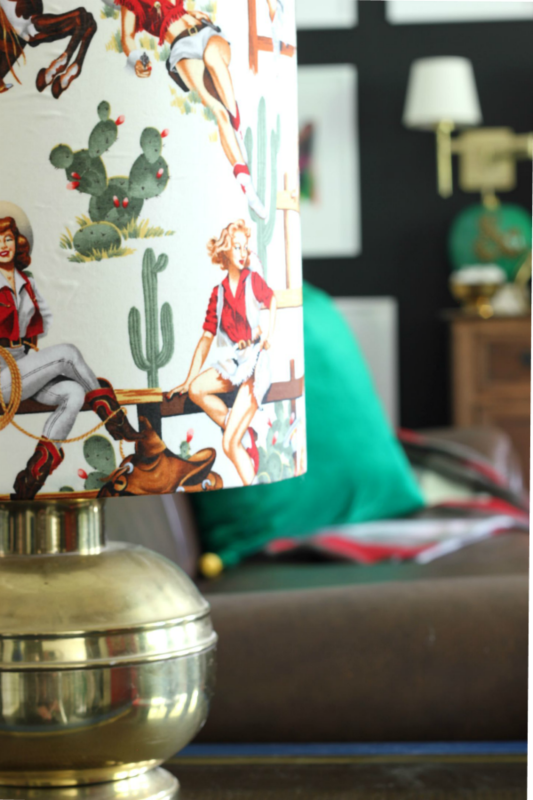 And put the cowgirl lampshade in the living room. And mix in a little red and gray plaid with another green velvet pillow. Because you can’t have enough comfy green velvet pillows. 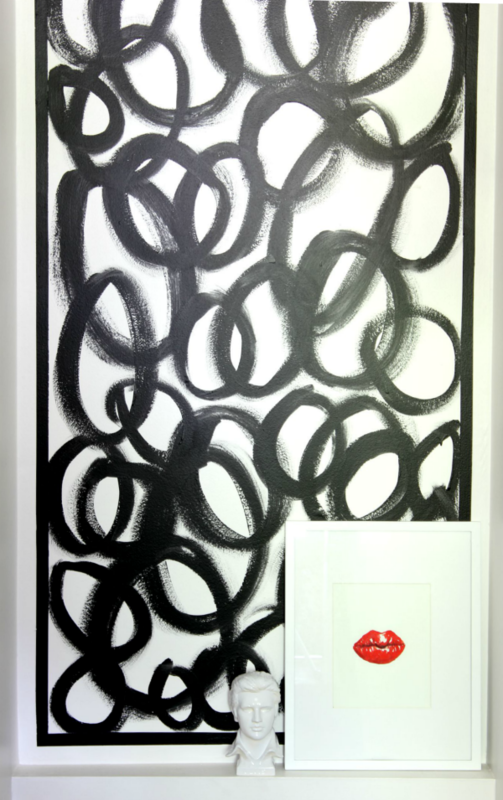 We’ll put Elvis against a random abstract circle wall beside red watercolor lips. Because every home needs a little Elvis in their lives – whether its fall-ish or not. P.S. That abstract circle wall is the stairwell! I finally figured out what to do with it – it only took me five months – more on it soon! What are your favorite fall-ish decorating pieces? Besides pumpkins! The next tour stop is Style Your Senses – I promise Mallory won’t let you down! How fun, I adore country music too and I love that blanket and shade. Fun, fun, fun. Thanks, Marty! That shade is one of my favorite things – so fun! Jenna I am a big fan of creating vignettes with time earned memories verses recent home store decor finds. You have it in spades and yes, Elvis, in my opinion, is fully seasonal. Great tour! Thanks, Laura! Me too – I would much rather decorate with treasures than something brand new! Glad I’m in good company! Love the boots and green velvet…great touches of Fall! 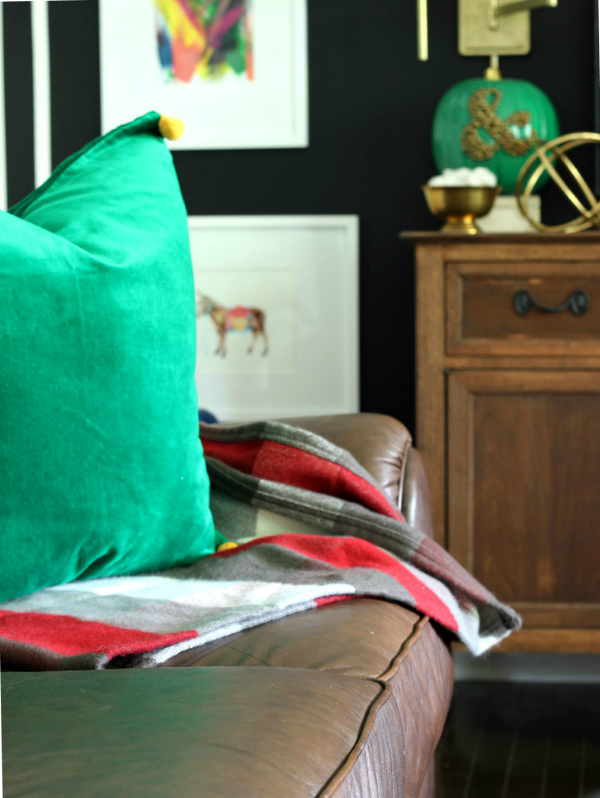 I’m obsessed with that green pillow – can’t wait to see the stairwell! Me too, Meg! Couldn’t resist them! You’re speaking my language! LOVE country music, boots, hats and a cowboy in starched jeans & western shirt! Do you know where I might find one? 🙂 Seriously, I love your decor ~ all the time! I know Elvis approves. Did you make the lamp shade? Girl, if I ever find a cowboy in starched jeans and a western shirt, I’ll let you know! haha! And yes, I did make the lamp shade – there’s link to the how-to in this post! Love your blanket & lampshade Jenna. Love cowboy print( I have a Cath Kidston bag in a similar print ). Thanks, Shirley! Those are two of my favorite things! Love me some Play It Again – totally one of my jams! LOVE LOVE LOVE! And if you ever find your way to Houston… I would be happy to take you to a little ol’ place where we go to hear country music artists – my treat! Joy, a Texas trip is definitely in mine and Grunt Labor’s future! I’ve been before, but he hasn’t. LOVE Texas! Hopefully, we will get to Houston sooner than later, because I would love to hit up some little places with awesome country music – they are always the best! I love your sense of style. I look forward to opening my email every morning and finding your blog post. Where oh where did you find the Elvis bust?! I NEED…uummm…WANT…him for my living room!! Reece, you made my day!! Seriously, I don’t know how many people that would look forward to seeing my name in their inbox everyday! haha! Oh, that Elvis bust – funny story! I went on the world’s longest yard sale with a friend (its just a little ways from where I live) and found an Elvis bust that I loved for $40, but couldn’t bring myself to pay that much for him. I came home, looked on Ebay and Etsy and there were more, but around $20. I was about to buy one, but thought no, I’ll wait until after I hit up more yard sales today. And would you believe that the first one I hit up that day they had that one for $2!!? $2!! Now, he does have a chip and I had to spray paint him that glossy white, because he was stained, but man he is one of my favorite finds! Jenna, you had me at the cowboy boots, hat and blanket! So perfect for fall. Love your little entry vignette… bring on the quirk! 😉 Is that green pillow from Joss & Main? I think I remember seeing a similar one there and loving it, of course. Fun tour as always, Jenna! That entry vignette may be one of my favorites ever! The green pillow is from Pillow Central – they have a huge selection! Of course, I had to go with kelly green ones though! I love your cowboy & Elvis loving fall home! You home is one of the most unique ones in blogland (and I mean the cool kind of unique 🙂 Thanks for sharing it! Glad its the cool kind of unique, Kris!! haha! Thank you! Jenna. Love ALL of your blogs. As we say in the South. You are some of me!!!! Look forward to you everyday!!! Thanks, Christie!! Seriously, that makes my day! Love love love your eclectic mix and amen to the country music!! That abstract art is to die for! Thanks, Summer! Glad to have another friend who loves country music! That blanket is to die for!! The whole decor makes me feel warm and comfy 🙂 Love it! Thank you, Pam! That blanket is one of my most favorite things in the whole wide world. My grannie made it for my dad and uncle when they were kids. aaawww ~ those really are the precious things we treasure most. When my Dad passed, my Sister had a (decorative) pillow made from one of his sport coats. It’s gorgeous!! That is such a sweet idea, Pam! I have some of my Pap’s old shirts. I’ll have to look into that. I totally think they should be year round too! haha! I’ll have more photos soon, Mary! you are sooo funny !! thank you for not posting pumpkins !!! your my fav blogger !! you rock !! i hope i dont sound creepy LOL !!! cause im not i probably shouldnt have had second bottle of wine !! peace love and happiness always !! !